I am somewhat of a food junkie, meaning that I am picky about what I eat. I follow food news and indulge regularly in food documentaries, but for the most part, I try my best not to preach about food -- nobody wants to hear about calories and nutrition while lurching over a double-bacon cheeseburger. Recently, however, I watched a film by Stephanie Soechtig called Fed Up. The premise is that the food most of us consume every day is wreaking havoc on our body and minds, and that low energy and moodiness is the result for us eating poorly. Our physiology is causing us to become addicted to our bad diet, a result of the incredibly high amount of sugar and additives in our foods. Avoiding these bad and addictive foods requires discipline and a strategy, but Mike Kamo, a nutritionist and founder of NutritionSecrets.com, suggests that you can break from your bad eating habits today by simply adding a few high impact foods to your diet. Here are 10 foods Kamo recommends you start eating right away to get on the road to a healthier and more energetic day. Protein is key for energy throughout the day, and chicken is one of the best sources you can find. Keep it grilled and simple -- avoid fried or prepared in sauces, cheese, etc. Another amazing source of protein and other vital nutrients, you can eat eggs throughout the day, not just for breakfast. And do not fear the yolk, as evidence continues to demonstrate its health benefits. Packed full of omega 3 fatty acid that have proven positive effects on your health, eat fish and shrimp as often during the week as you would like. Kamo suggests salmon to get the most out of your serving, but aim for wild salmon when possible. Another great source of protein is dairy products, and Greek yogurt packs a great punch with more than double the protein of normal yogurt. Avoid Greek yogurts that are high in sugar and contain high fructose corn syrup, and instead try a plain Greek yogurt with a tablespoon of your favorite jam or preserve. Nuts are dense with healthy fats that help reduce your risk of heart disease and ease your hunger cravings. Kamo suggests aiming for a handful (15 to 20) of almonds for a quick snack to carry you to your next meal. You can also drink almond milk to get the same boost with half the calories of skim milk (do not substitute for milk however). Also consider substituting your regular peanut butter for almond butter. All of these almond substitutes are typically a little more expensive but well worth the investment. A food staple throughout the world, oatmeal is an incredibly nutritious meal packed with many health benefits. Avoid the quick-serve flavored bags that are packed with sugars and opt instead for steel cut oatmeal. It requires more time to prepare, but you can prepare several servings at once and refrigerate them for quick heating later. Mix your serving with a dash of salt or a tablespoon of jam or preserves to add flavor. Without a doubt, you should be consuming greens throughout the day. Salads are a great source, as long as you are not filling your plate with iceberg lettuce and high-calorie dressings. Kamo suggests adopting kale as your go-to green. Get creative with it -- salads, burger toppings or blended in your smoothies. Want a healthy and flavorful snack? Shoot for a handful of berries to deliver energy and a healthy dose of antioxidants. Kamo suggests blueberries, which have numerous health benefits that include improving memory to lowering blood pressure. The under-appreciated hero of health is garlic, which research has shown reduces risk of lung cancer, osteoarthritis and high blood pressure. The downside is the odor, so add it to meals later in the day when you won’t be trapped in a conference room with your peers. Eating healthier does not mean avoiding all sweets. In fact, dark chocolate has more antioxidants than blueberries, so mix a small portion with your favorite berries and nuts for an awesome power snack later in the day. Remember that not all chocolate is the same, so aim for high cacao content (dark chocolate range is 70 percent and higher) with minimal sugar and additives. If you want to get more creative, consider cacao (the raw form of cocoa), which can be added to smoothies for a great boost to your immune system. Although eating healthy every day can boost your creativity and productivity by reducing the physiological wear and tear of junk food, almost every health advocate I know recommends you splurge once in a while. So if you go an entire week eating healthy and being productive, give yourself the leave of absence from your new healthy eating habit and indulge in something you really enjoy. 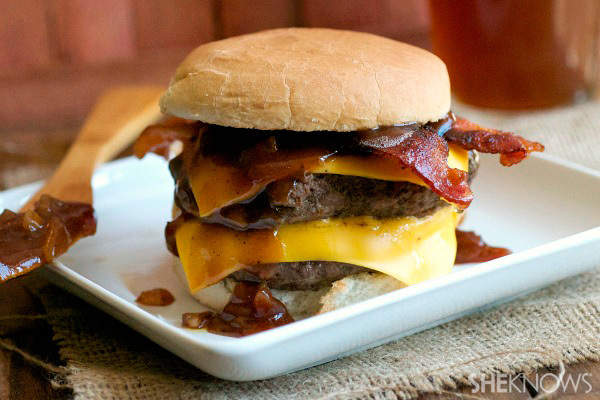 I know what I’m having for dinner this weekend -- double bacon cheeseburger. It had me from paragraph one.